Kneeling is everywhere we look or listen right now. Professional football players have been kneeling during the playing of the National Anthem at games, in protest of police brutality against minorities. This has conjured an immense nation-wide reaction. On one side, people say these men are using their first amendment rights to peacefully protest. On the other side, people say they are disrespecting the flag, our freedom, veterans, and America. I honestly don’t see how you can have one without the other, but there is another point it seems many have missed: since when is kneeling a sign of disrespect? In the legend of Hardy’s era, the oxen in their stalls, on the most holy of nights, are struck to their knees at the glorious revelation of God to mankind. We kneel to pray as a gesture of humbleness before God. In Rome, there is a flight of 28 marble steps inside a small chapel. It is the Scala Sancta (Holy Staircase), brought from Jerusalem, and it was a part of the palace of Pontius Pilate. It is believed that Jesus himself walked up these stairs, on his way to be tried by Pilate. Since the 4th century, Catholic visitors to Rome have come to the Scala Sancta, to climb them on their knees. I read an article about a woman in China who went to an official in the environmental protection office, carrying a canister of contaminated water from her local river. She went to show him what her town was dealing with, and tell him how it was affecting their health and lives. When she was shown in to his office, she dropped to her knees as she begged him to listen and to help her community. The writer of the article was aghast at this demeaning display. He explained that in Chinese culture, it is almost unheard of for someone to kneel to anyone. For her to do this, to kneel before an official, meant that she was truly desperate. Are kneeling athletes showing a lack of respect for our flag, our National Anthem, and our country? Or are they on their knees, supplicating the world to listen, to help their community? They could remain seated (which is under certain circumstances acknowledged as a sign of disrespect— for example, everyone stands when the President enters a room). They could turn their backs. They could shake their fists. Let’s face it, they could moon us all on national television. But they kneel. A posture which is universally recognized as a gesture of respect, humbleness, or desperation. Of course, there is a much bigger issue here — what are they kneeling about? Police brutality against minorities. They have been very clear about this, even though some people are choosing to ignore it, and instead insist these protests are against patriotism. A man on a call-in show this morning, who is angered about the “take a knee” protests, talked at length about veterans, homelessness and single mothers — all of which are great things to be concerned about. None of which have anything to do with this particular protest movement. “But,” people will say, “that isn’t really a thing. Police kill more white people than black people.” Even though statistically that isn’t accurate (an unarmed black man is 5 times more likely to be shot and killed than an unarmed white man), let’s take a look at that statement: “Police kill more whites than blacks.” So then the BIG QUESTION I want to ask here is this: Are you saying you’re okay with that? Are you saying that since, if you look at the numbers without taking population percentages into account, there are more white bodies than black bodies, no one should be speaking out? According to a Washington Post article published July 11, 2016, at that point in the year police had shot and killed exactly the same number of white, and black, unarmed people: 50 each. Is everyone okay with that? Really? What I want to know is, why isn’t everyone kneeling? I am all for supporting our police forces. I am also all for holding people accountable when they make bad decisions. Some of those shootings were not justified. Some of them were the result of fear or hot-headedness. Some of them were outright mistakes. And yes, some of them were influenced by the fact that the person in the crosshairs was not white. The data shows this to be true. If no one speaks, no one knows there is a problem. If no one knows there is a problem, it will never be addressed. If it is never addressed, it will grow. Ours is a government of the people, by the people, and for the people. It is our responsibility to speak up when something isn’t working. Right now, certain professional athletes are making use of the fact that they have a public platform to peacefully, and I would argue, respectfully, speak up. I implore everyone, from here on my knees, to listen. “Rehearsal did not take place. This is an excerpt from a journal entry by Karl Eliasberg, conductor of a rag-tag orchestra that was asked to play Shostakovich’s Seventh Symphony during the siege of Leningrad in World War II. They were instructed to rehearse the newly written music and perform it in the Grand Philharmonic Hall. By that time, Leningrad had been under siege for over a year. People were eating rats, horses, and their pets. Thousands had already died of starvation. The little orchestra lost three members during the weeks of rehearsal. Weak from hunger, sometimes they only played for 15 minutes before giving up for the day. Eliasberg mentions a trumpet player who could not produce a single note one day, and that some of the musicians could not lift their instruments to their mouths. The wind players in particular, were prone to fainting from the effort of playing. Nonetheless, on August 9, 1942, the orchestra of starving musicians performed the entire symphony. They had only managed to get through the whole thing once before–three days prior to the performance. Speakers had been wired all over the city for everyone to hear the music. It was broadcast on the radio so the Russian military could listen, and speakers were also aimed over the walls, toward Hitler’s army encamped without. The Russian troops were sent out on a particularly harsh raid, in an effort to push the Germans back and prevent them from bombing the city during the concert. Despite the poor artistic quality of the performance (the musicians struggled to finish), there was a one hour ovation from the audience—and it is considered to be one of the most important artistic performances of the war because of the psychological impact it had on both the Russians, and the Germans. Eliasberg commented, “in that moment, we triumphed over the soulless Nazi war machine.” On hearing the music, many of the German troops wept. In an interview years later, some of them said it made them believe they would never take the city, whose people were so brave and defiant. They were right; though the siege continued for another year and a half, in the end Leningrad (better known today as its original name, St. Petersburg) was never given over to the Germans. First, there were protests happening all over the country about police violence against black people. Shootings were happening in retaliation and people were taking to the streets in response to verdicts that were being questioned in regards to the true justice of the situation. Second, my friend Timothy’s best friend Keith lay in a hospital, hundreds of miles from home, hovering near death. Far removed from either of these, I started in on a new portrait of a man who just happens to be both black, and a former police officer. As my country descended into anger and fear, I pondered how to mix African American skin tones correctly. One day as I worked, preoccupied by the latest news of unrest and violence, the story of the Cultural Revolution in China started whispering in my mind. Launched the year before I was born, this movement swept through China with a vengeance that is startling to read about. Simply having an education put one in jeopardy of arrest and imprisonment. Shades of the French Revolution, when any man, woman or child born with the wrong heritage was condemned to death. Both of those sound utterly ridiculous. But it is important to remember that isn’t where they started. Sometimes things start with an innocuous idea–something like, “I think the majority of our citizens have become too far removed from their roots, and the work it took to make us a prosperous nation.” But taken too far, bereft of wise leadership and common sense, such ideas have, in the past, descended into anarchy. I heard the news about the protests here in the present US: race against race, police against citizens, citizens against police. Riots. Police barricades. Burned out buildings. There was talk about deportations based on religion. Fringe groups that had long been despised started showing their presence more brazenly, and finding support for their views. Photo by Jonathan Bachman. A young woman at a protest in Baton Rouge, as police in riot gear approach to arrest her. At the same time these events and thoughts were running through my mind, Timothy called to tell me that Keith, already fragile from a lifelong, progressive illness, was in the hospital. He was on a respirator and couldn’t talk. He was in so much pain. Driven by sorrow from what I was seeing on the news, hearing the tears behind Timothy’s voice when we talked, I painted. I painted because that was all I could do. 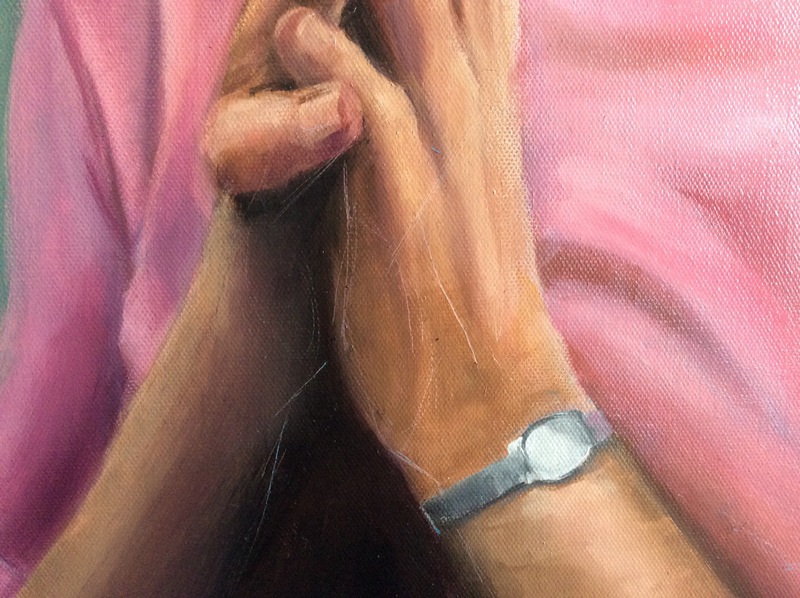 Late into the night, every night, I painted Olu’s beautiful pink fingers, his restful face. I sat through my job every day counting down the hours until I could get back to my studio, barely taking time to eat. I took a new photo and sent it to Timothy each night when I was too tired to paint any more and had to stop. I typically give myself two months to complete a portrait from start to finish. I painted Olu in two weeks. And I titled the painting not only as an homage to the subject, but also as a message to myself. Painting Olu’s portrait during a time of great unrest in our country didn’t change any of the outcomes. But it felt like I was painting in protest of the events, bringing in a measure of peace, if only to my own studio. Many people have told me that they are inspired by Olu, and why I chose to paint him for the FAMOUS series; he is now a non-violent confrontation counselor, working to stem the progression of domestic violence from adult to child. Seeing the progression of the work helped Timothy find strength to face whatever news may have come to him each day (Keith, by the way, made a fairly miraculous recovery and is again home with his loving family). History has shown us time and time again, that every once in awhile an entire society collectively loses its mind. When that happens, the horrors that are unleashed make the rest of the world draw back aghast. And when that same society eventually awakens from its demonic frenzy, it is aghast as well. Then the questions are asked: How did this happen? How could decent people allow this to happen? What led up to it? How could it have been stopped? And the inevitable affirmation: Never Again. Never, ever again. I feel we are teetering on the edge of something. The last six months have shown that we are so much more divided, and there is so much more anger and fear at work in our country than I had dreamed. Things we thought couldn’t happen here, are happening. Something has been awakened, and it remains to be seen what the repurcussions will be. I slowed the car to a stop, slack jawed. “I demand a cease-fire.” One unknown man, caught in the cross-hairs of two warring forces, in a conflict that has the attention of every major government in the world, was demanding a cease-fire. Just like that. Standing up, taking the one small opportunity chance had handed him to have his voice be heard. It is tempting to look at such a statement and think it is insignificant. One voice does not bring about large change. One demand from an unknown civilian does not stop a war. His statement will not make any difference. But turn again to our great teacher, History, and we realize that governments and politicians have long understood that one person, one voice, can indeed rouse great change. One of my college professors once said (referring to a time of political oppression), “First they round up all the writers, then they round up all the artists.” His words weren’t idle, as we have witnessed again and again. Stalin and Hitler both enforced a state-approved style of art, and the rest was condemned. The Nazis put on the notorious “Degenerate” art show, meant to deride the artists who were working in abstract or “modern” styles. More than that, artists who were deemed ‘degenerate’ were fired from teaching jobs and banned from creating art. Putin’s Russia has warned, jailed, and outright killed artists and writers who disagree with the State. Ai Weiwei drops a Han Dynasty urn in a video, in protest of the Chinese government’s human rights violations; his studio is bulldozed and he is jailed for three months. The list goes on and on. The Cellist of Sarajevo, Photo by Mikhail Evstavfiev. This is not a staged photo: Vedran Smailovic plays Adagio in G Minor in a bombed-out library in 1992 during the siege of Sarajevo. Smailovic played in many destroyed spaces, and at funerals in protest of the war. Everyone roots for the underdog in a movie. Everyone pulls for the forlorn hobbit, wandering over the endlessly treacherous landscape while the ever-present forces of evil try to find him. And here’s the thing: the hobbit always wins. The tiny speck of light out-does the greatest darkness every time. There may be much suffering along the way. It may take a long time. But somehow, the light eventually comes through in the end. I believe it is time for every artist, writer, musician–indeed, every person in our addled society to step up to whatever microphone chance may hand you. Throw your voice into the vacuum that threatens to pull us down into chaos, believing that your one voice can indeed change the course of events. Raise your instrument to your lips, for as long as you have the strength. You are the light. You are the light. You are the light. My eyes half opened as the sound slowly registered into my sleep-filled brain. A distant, persistent drone of a motor was somewhere in the vicinity. Burrowed under the pile of blankets, I vaguely registered the sound, took note that it was still all but dark, and drifted back into my dreams. Hours later when I got up, it was to a bright new snowfall. While I like snow, the work that comes with it to clear away walks and driveway is one of my most hated chores. I dutifully bundled up and shuffled outside, so that I shovel and then shower away the sweat and get ready for work. I stepped out of the garage and stared, blinking in the morning light, at my freshly cleared driveway and sidewalk. I moved to Wisconsin in January. It was a very cold, snowy winter that year. Almost every time it snowed, my walks and sometimes driveway were cleared by a mystery visitor whose presence was announced by that very early morning drone of a snowblower. Once or twice I caught site of someone bundled up to the eyes, wrestling with the large machine in the dark. I didn’t get a chance to meet him or thank him, all that first winter. To my shame, it was actually a few years before I did meet him–my neighbor 2 doors down, Norm. He stopped to say hello as I was raking leaves, and when I asked if he was the angel who cleared my walks, he said, “I don’t know about the angel part, but I do like to clear the walks.” Turned out, he’d been doing that for many years, for all the neighbors around us. After that we bumped into each other on occasion, as I walked my dog or worked in the yard. We didn’t know each other well. He knew I was a graphic designer. I knew he was a Vietnam veteran. When he told me they were planning to move south to Missouri, I was sad because he was one of the few neighbors I knew at all. One problem: I didn’t know his last name. By this point they had been gone a couple of years. I didn’t have the slightest idea of how to find him. As my friends can tell you though, I am the queen of internet research. After puzzling about it for a few weeks, it occurred to me to look up the city tax records on their old house—and there it was. From there, I googled his name and “Missouri”, and actually found him on facebook. Sent a message off, and was overjoyed to receive a message back almost immediately. He gave me permission to paint him, and from a photo I chose from his facebook profile, I painted the first portrait that was specifically for FAMOUS. What I love about Norm’s portrait, besides my connection to his kindness and helpfulness, is the story about finding him back after he’d moved away. Because you see, that in itself gave me a directive that I have been striving to be true to ever since. Because you see, Norm’s last name is Goforth. So today I pass that along to all of you, where ever you may be in your journey. Maybe you’ve found your voice; maybe you’re still looking for it. My wish for you is to keep striving, keep looking, and once you have found it, stay true to that calling. It is sacred. Find your purpose. Be famous. Go forth. Every year, the National Portrait Gallery in London hosts a competition for portrait artists: The BP Portrait Award. The work that gets included is the ‘best of the best’, and entries pour in from around the world from artists hoping to be selected; in 2015 they chose 55 out of 2,550 entries. This year one of the reviewers complained that the curators had gone a very traditional route when choosing the contents of the show. This is an ongoing discussion in the world of portraiture, revolving around what makes for a good “modern” portrait. It is part of a larger stance in the art world of denouncing realism and applauding the abstract and conceptual. Part of the idea is that if you are not doing something new or different, if you are not trying to push your genre “forward,” then you are not a serious artist. Maybe you actually aren’t an artist at all. The reality is that if someone commissions you to paint a portrait, they generally expect the resulting painting to unmistakably resemble the subject—but now portrait artists are being criticized for doing that very thing. There is art and there is Art, and a traditional portrait, however well executed, is being relegated to the lower case. There are artists, and Artists. When a portrait artist paints a faithfully rendered likeness, with true-to-life colors, proportions and perspectives, it appears they may now come under fire for repeating something that has already been done. When did working your whole life to master a very difficult skill become a worthless goal? No doubt Mr. Khan thought his comment about modern portraiture resembling “ the Van Dycks upstairs” was an insightful jab at a group of artists who continue to paint in a traditional style. I for one would be cartwheeling through the halls if someone thought my work in any way resembled a Van Dyck. I paint using a classical approach, following a technique developed centuries ago. One difference is that I prefer to tone my canvas with a blue-gray to start, rather than a more traditional earthtone (my foot helps show the size of this large 30×40 canvas). I draw my composition onto this toned canvas in graphite, and then paint the whole thing using only very thinned-down raw umber. This establishes the lights and darks. So, by the time I begin to paint with color, I have been over the entire thing twice, and am very familiar with my subject. Starting with the face, I now start setting color in and establishing the planes & angles. This is my favorite part, as it seems to emerge and come to life and it almost feels like sculpting at times. Pushing and pulling forward and back to set the form. I rarely have a good likeness at this stage, as is the case today. I recently had a long ride on the New York subway, coming into the city from the airport. When I got on there was a man sitting in the farthest front seat, his body hunched protectively over the 3 ragged bags around his feet. A frayed woolen cap was pulled low on his brow, and he was dressed more warmly than the balmy weather outside might dictate. He stared at the ground. Homeless. Possibly unbalanced. One glance took this in, as I and everyone else moved farther down the car. No one sat across from him, even though for some of us it meant having to stand. As the car filled up more and more at each stop, still no one chose to sit across from this man. I clung to the pole I had claimed as I tried to learn the unfamiliar movement of the train. As soon as someone got up to leave a few stops later, I quickly slid into a seat. From my new vantage point I watched as a young man dressed neatly in a sweater and long shorts walked to the middle of the car and set down a small paper bag with a few dollar bills peeping out. One of his legs, from the knee down, was a gleaming metal prosthetic. “Good morning ladies and gentlemen,” he began, as the train swayed into motion again. “I do not enjoy being homeless, and I try very hard to stay clean. If you could find it in your heart to help out in any way you might be able….thank you,” as a few people held out dollars and coins to him. “Here, brother,” a voice came from the end of the car, and I turned to see the original “homeless” man moving forward, a five dollar bill clutched in his hand. “God bless you, God bless you,” murmured the young man. The courtesy passing between them put all of our presidential hopefuls to shame. Perception is a tricky thing. When first starting the “Famous” portraits project, I looked for a way to contact Naomi Shihab Nye, whose poem “Famous” is the inspiration for the series. I wanted to see if she would consent to being included as a portrait subject. 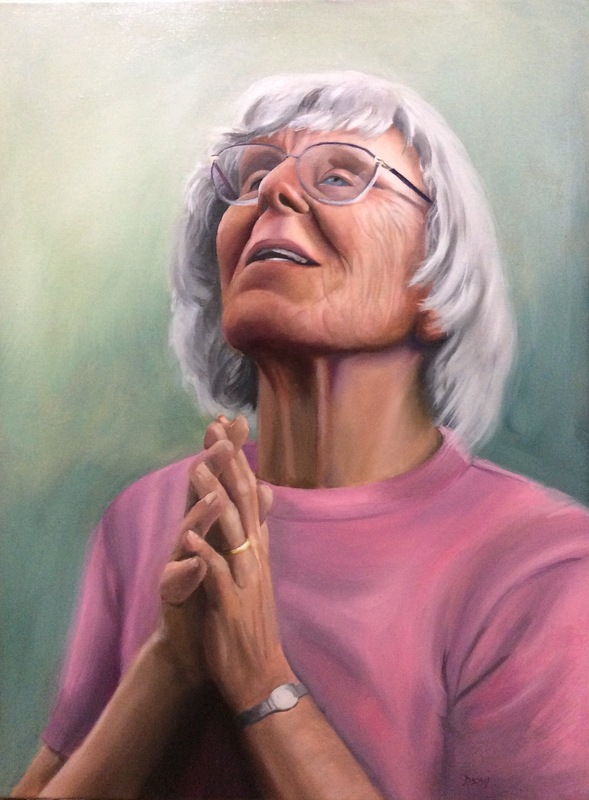 To my surprise and delight, she responded almost immediately to my first note, with a warm and very kind letter which included agreeing to let me paint her portrait. Given that she lives in Texas, I live in Wisconsin, and she travels all over the world almost constantly, it was another matter to try to coordinate a meeting for a photo shoot. While not ideal, I don’t always get to do my own photography for portrait subjects—I suggested that I could work from a photo, if she had a good one of high enough quality. She responded to that idea enthusiastically. Over the next few months during her travels, she sent me photo after photo, all of which were completely useless as reference material for a portrait. She sent a photo of herself in Abu Dhabi with a group of about twenty school children, her face almost lost in a sea of little smiles. There was one from Ireland: a snapshot of her with two men (“I’m the girl in this photo”), she sandwiched in the middle, all of them grinning happily with arms entwined. Hong Kong: a lovely view of lush forest—and Naomi in silhouette in the foreground. “Busted!” was her immediate reply. What to do with a portrait subject who doesn’t want to be seen? I assured her that I took the responsibility of painting her very seriously. She assured me that she trusted me. As luck had it, we did get a chance to meet in the fall of 2015 when she was speaking at a book festival in my state. Contrary to her internal dialog, she is very photogenic and I came away not only with some good material to work from, but an enhanced respect for her as well. I spent 2 days trailing her, listening as she spoke in schools and talked to kids about poetry. I watched her keep a large audience at a university captivated for an hour and a half, and duck her head in apparent surprise when they gave her a standing ovation. I learned that she doesn’t allow someone introducing her to list her awards (which are many); instead she wants them to talk about how her writing may have spoken to them personally, or which particular poem they like. Perception, humility, kindness. Two homeless men on the subway. A brilliant writer shrugging away accolades. People who don’t know me, opening up their time and energy to help propel this art project forward. I understand that we all have an internal view of ourselves, and “know too much” as Garrison Keillor says, to really take ourselves all that seriously. I started working on Naomi’s portrait about a month ago. The painting is almost life-sized, which makes me nervous given her reservations about being prominently featured. Maybe she will forgive me. Maybe I will manage to capture not just the likeness of her face, but something of her spirit which refuses to believe she has done anything unusual, while traveling the world and inspiring people who have also found that kindness can be a rare event. That it can be like a cool cloth pressed to a feverish cheek. Or a five dollar bill offered on a subway. “Look at me now!” The man’s proclamation still rings in my ears, weeks later. Who knows what paths have brought each of us to where we stand today? Who knows what obstacles have been overcome to get here? Before casting our mental vote assigning someone to a particular class or group, how often do we consider that they may well be proud of where they have gotten themselves? While ruefully lamenting the loss of her “youthful sizzling best,” I dearly hope that Naomi has not missed the blooming of the beauty she has spread to the world, in a way that few of us ever will. She may wish (as most of us do) to turn back the clock and erase some of those lines we all earn with the daily effort it takes to navigate the world. But oh, Naomi, look at you now. Today we are blessed with an essay from a guest blogger, one of my “Famous” people! Travis DuPriest is a retired English /Creative Writing professor and Episcopal priest who with his wife spends part of each summer on the James River in Isle of Wight Co. VA. I have a few things that belonged to my father: his bamboo fly rods, a wrist watch which I gave to our older son, some studs and cuff links, some country Chippendale furniture he saved and refinished from various barns and back porches in Piedmont Virginia. When I think about it, though, I’ve probably inherited more qualities than possessions: his body build, his baldness, his love of being on the water, preferably fishing, and I hope some of his dedication, affection and tenderness. At the time of his death, just on the cusp of his 60th birthday, I didn’t really want any of his “things.” He died much too early, just as I got married and was finally holding down a real job, earning a living, rather than going to yet another graduate school. (I heard from a neighbor that my dad almost cried when I told him I was going to Divinity School after Graduate School). In other words, my dad died before he could be proud of me. Before he could be the grandfather to our children. And I was angry – angry at him for checking out so early. And I took out that anger, foolishly, by not saving more personal items. I eventually came to realize how incredibly self-absorbed all this was. After all, most grief is for ourselves, isn’t it? If there was any saving grace in all this, it was that I was even angrier at myself — for the completely irrational reason that I wasn’t with my father when he died. Wasn’t even nearby, wasn’t “home” the night he came back with my Mother from dinner with friends and died. It was completely irrational, but there it was. I just felt that I should have been in Virginia, in Petersburg, in his bedroom. Near him. For weeks I was obsessed with this notion of not being there. Darting through my mind was the question my dad’s brother had asked me, “T ( my childhood nickname), when are you going to move back home?” I’d hated that when my uncle asked me that question, implying I was some kind of traitor to abandon my native Virginia and my family. Now I was asking that of myself that very question. I was in college at the University of Richmond. My dad stopped by the fraternity lodge where I was living my senior year, to take me out to lunch. It hadn’t been planned. My father was in Richmond on business and just stopped by to take me out to lunch on the spur of the moment. Yet somehow, in the dream world, I wasn’t at all surprised. We ate lunch at a little café out in the country somewhere outside of Richmond, and after lunch, we walked down a country lane, talking. Eventually, we hugged, and I turned to walk back to my car, and my dad walked away in the opposite direction. He turned and smiled then kept walking down the gravel road bordered with tall loblolly pine trees. And, yes, in my dream he walked into an intensely bright and comforting sunlight. He had come say Goodbye. He had come to assure me that my not being there when he died was okay—because we have never really ever been apart. After the dream, I regretted even more my hasty decision not to keep more of his things: I wish I had his Harris Tweed sport coats with the smell of his pipe tobacco, his suits, his hats. But I do have My Father’s Tie. My dad either bought or was given the tie in the late 1930s — probably while he was a freshman, on a football scholarship, at Wake Forrest. It’s a woolen “Dress Stewart” made in Scotland. To my knowledge my Father’s family, the DuPriest’s, a French Huguenot family that settled in New Kent Co. in the 1680s, had no claim to be part of a Scottish clan. He must have just liked it. As do I. I wear it because I like it. And, of course, because it was my Father’s. And because, when I put it on, I’m aware of my father’s gentleness and patience. In a recent issue of the Harvard Divinity Bulletin and on several websites, Vietnamese Buddhist monk Tich Nhat Hanh’s concept of “inter-being,” the space created between the art and the viewer, is referenced. In this space, as I understand it, all that has gone into the piece of art is summoned and something new is created. When I see the portrait titled “My Father’s Tie” a new relationship springs into being between the art and me, and a new relationship between my father and me is formed within. Material objects often get a bad rap from preachers and spiritual writers. And to be sure possessions can be burdensome. Possessions can own us, as Thoreau put it. But possessions can also form deep connections that bring us into expanded consciousness. In other words, certain possessions function as relics with the ability to transport us out of time and space to a different, perhaps even sacred, sphere. If the archeologists of the human condition, Mircea Eliade, Carl Jung, and Joseph Campbell, are on target, then our life’s work is to find our place, our role, in the central mythos or transformative myth, of our culture, so it is my work to find and live out my proper role in the narrative of my family – as son, husband, father, grandfather, friend. When I wear My Father’s Tie, I’m riding in the car with my dad’s arm over my shoulder; I’m fly casting at Mountain Hall Farm, I’m learning to back up a trailer, and I’m a freshman at Wake Forrest, just out of Crewe High School in Nottoway Co., Virginia, a handsome, dapper young man, with a head of curly black hair, dating the beauty queen of Lunenburg Co., dancing to the big band music of Tommy Dorsey. And wearing the best looking tie on campus. Naomi’s father was a Palestinian refugee, and she witnessed the everyday realities of that conflict from ground level when she spent part of her childhood living in Jerusalem. She has written and spoken extensively about the need for understanding, and for viewing things from a zoomed-in, personal perspective before passing judgement on any given situation. I sometimes think of those lines from a little different perspective too, in that we all have hardships we have dealt with or are dealing with, and how important it is to look beyond those moments to see where or how we are moving past them. Sitting here on my couch, I look across the room to one of my works-in-progress, a portrait of a woman named Diet Eman. Diet (pronounced DEET) was 20 when the Nazis invaded the Netherlands, her home country. She and a group of 15 other young people went to work finding hiding places for Jews and stealing ration cards to feed them all. She spent the entire war working with the resistance, and by the end of it all she had spent time in a concentration camp, and lost 8 of those friends–including her fiance’. Then, because she is an adventurous sort who claims that all she ever wanted was to live “an interesting life,” she spent the rest of her life telling the story of her work during the war, working as a nurse, and volunteering for the Red Cross as a translator, going into disaster zones, sleeping in the mud. Years ago, rushing to get onto the ice where a student was waiting, I forgot to take the hard guards off my skates. As any skater who has done this (& we’ve all done it at least once) could tell you, the resulting fall was horrific. I honestly thought at first that I had broken my hip. I limped for a month afterwards, and it wasn’t until I spent several months in physical therapy that the pain truly left me. But that spot, where scar tissue is permanently entwined with the muscle structure, is vulnerable. If I don’t take care of it with stretching and exercise the pain begins to seep back in. It seems to work that way with our psychological scars too. By this time in my life, I carry a few deep mental/emotional scars, as most of us do. I am not a believer in the idea that, because someone else’s suffering is greater than my own, it makes mine less important or impactful. We all carry the scars of past hurts, experiences, and disappointments. We all feel the recurrent pain of a scar, long healed over, when it gets reopened just a bit. I took Diet’s portrait to a critique session, looking for help in a few areas where I was stuck. My mentor, Mindy, started going over the painting area by area. “See here, where the palms of the hands come together,” she said, tracing over the paint with the edge of a fingernail, “the angle should come up more steeply.” “And over here on her neck,” the fingernail sliced though the paint across Diet’s neck, “the shadows need to indicate more form.” This continued throughout the critique; I left with the portrait marked every which way with fingernail cut lines. I actually didn’t think too much of it at first, thinking I would just paint over them and all would be fine. But it didn’t work– the lines still showed very clearly. The cut across her neck was especially deep. I tried scraping it carefully with my palette knife, which left an even wider gap. I tried to fill the new gap by using paint kind of as spackle, trying to smooth the surface back out. Diet’s book, Things We Couldn’t Say, is a moving autobiography of her work during the war. She willingly speaks all over the country about her experiences. The tears that still come to her eyes, at age 94, attest to the fact that her scars do not entirely shield her from the painful memories. I agree with Naomi, wishing for resolution to old conflicts, healing of old wounds, and looking forward rather than back. But I also hope to remind myself and others, that the old scars we inevitably all carry are tender, and we should try to remember that we are among the walking wounded at all times. I am so honored to create a portrait for Diet, to commemorate her courage. And I think it is quite fitting that out of all the portraits that will hang for the “Famous” show, hers is the one that will forever carry hidden scars. May we all bear our own with as much courage and determination as she does hers.